Push notifications are a powerful channel that enable you to communicate with your app users when your app isn’t open or even running. 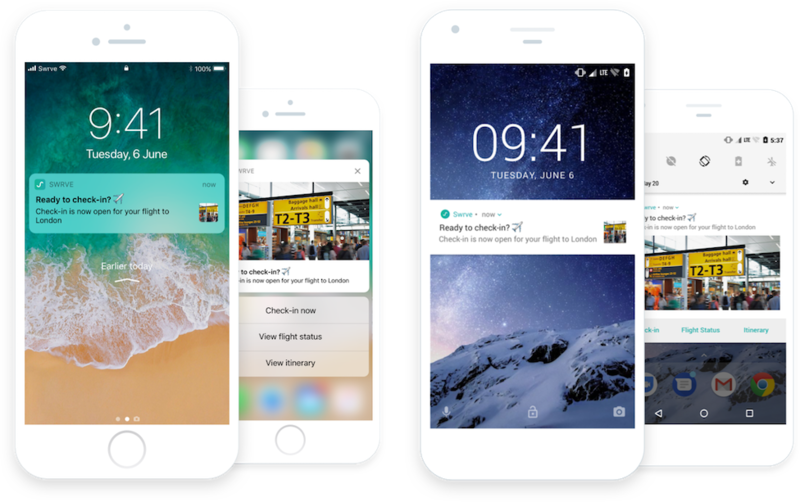 Swrve offers several types of push notification campaigns to help you engage with your customers in a timely, relevant and personalized manner. Coupled with Swrve’s behavioral segmentation feature, you can use push notifications to target the right message at the right people at the right time. For example, re-engage inactive users or promote special offers to a segment of premium subscribers. Additionally, Swrve enables you to include rich media content in your notification, dynamically personalize your message using custom properties, A/B test the content of your messages to compare conversion rates, or create localized versions of a message within a single campaign to target specific language groups. One Time push – Alert users about events happening within your app space by sending a one-off push notification. For more information, see Creating push notifications. Ongoing campaigns – Run recurring campaigns to daily or weekly target users who last engaged with the app, installed the app, or triggered another custom event a set number of days ago. For more information, see Creating push notifications. Quick push – Send quick, breaking news-type notifications to a predefined audience of users. For more information, see Quick push notifications. Transactional push – Send push notifications to a single Swrve user via a web API call from a third-party system, using the Push API. For more information about the Push API, see the Swrve push API guide. For information on creating a Transactional Push API campaign, see Transactional push API campaigns. Silent push – Send a background app update that silently delivers data to the app, such as new content. For more information, see Creating push notifications. The focus of push notifications is communication with users while they’re outside of your app. If you want to communicate with your customers while they’re using your app, use Swrve’s in-app messaging service or Conversations feature. For more information see Intro to in-app messages or Intro to Conversations. Have your development team complete the required prerequisites to enable push notifications in your app and add custom sounds or iOS action categories. For more information, see Push notification prerequisites. View some best practices before you create your push notification. For more information, see Push notification best practices. Create a new push notification campaign. For more information, see Creating push notifications. Send quick, breaking news-type notifications to a predefined audience of users. For more information, see Quick push notifications.